Here's another alternative to that traditional sweet potato pie I was talking about yesterday, but this recipe has a savory spin on it. These are as simple as it gets, all you have to do is peel and chop the sweet potatoes. Then it's as easy as tossing them on a baking sheet with a little olive oil and some spices. Roasting them at a high temperature, results in a crispy outside and soft inside. These would be great as a healthier alternative to fries as a side for burgers. Make them as a side dish for Thanksgiving, they would be great with a spice-rubbed turkey like this turkey breast. A turkey breast is a great idea for a smaller Thanksgiving meal. Preheat oven to 400 degrees. 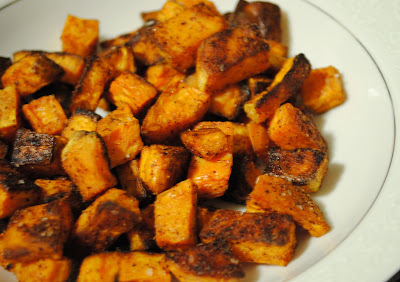 Chop sweet potatoes into approximately 1/2 inch cubes. Toss sweet potatoes with olive oil. Combine spices in a small bowl and sprinkle liberally over potatoes. Toss well and bake about 20-25 minutes. Use a spatula to turn the potatoes about halfway through the cooking time. The potatoes should be crispy on the outside and easily pierced with a fork. mmmmm!!! These sound so good and I happen to have some sweet patatoes on hand! Thanks for the menu suggestion for tonight's dinner! 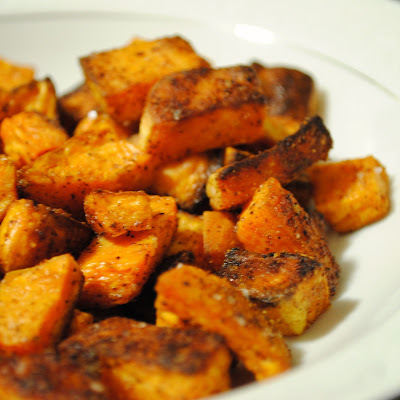 I have to bring the sweet potatoes for Thanksgiving and this recipe sounds delicious!. How many servings does your recipe make so I can figure out how much to increase the ingredients? Thanks! @MB - this makes about 4 servings. this sounds great! I always grow sweet potatoes, and I know they are very healthy, but I find them too sweet, and am always looking for ways to mask the sweetness. I am goint to try this tonight.